Well the Summer weather is on its way here in the UK and I have had the painter here doing the outside of the house and, of course, he needs to be kept watered and fed. So to that end this week I have been making Lemon Drizzle cakes. Plural because they seem to be going down well! This is a cake you can make by hand or use a machine; I tried both methods and the opinion was that there really was no difference. two greased one pound loaf tins. the grated rind and juice of one large lemon or two small ones. 1 tablespoon water or lemon juice. Just a reminder that it is always better to use eggs at room temperature when making a cake than straight from the ‘fridge. Beat the butter and sugar together well until light and fluffy, or put them in the mixer. Add the eggs one at a time with a little flour to prevent the mixture curdling and beat well. Add the grated lemon rind and the juice of half a lemon. Fold in the flour by hand, or if using a mixer, use the slowest speed. Divide the mixture between the two tins and bake for about 40 mins until golden brown and firm to the touch. 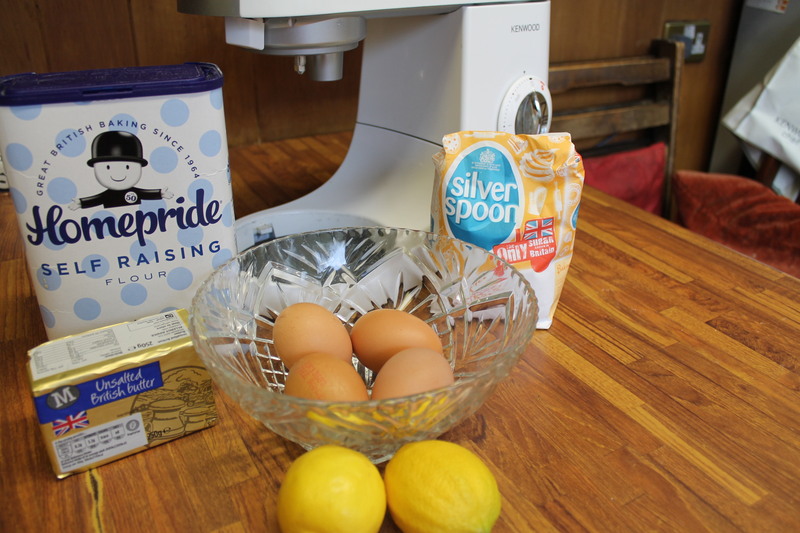 Leave the cakes in the tins to cool slightly whilst you mix the other half of the lemon juice with a teaspoon of sugar. Make holes in the tops of the cakes and pour the sweetened lemon juice all over. When cool remove from the tins and place on plates. Mix icing sugar with lemon juice or water to a thin paste and pour over the cool cakes, allowing the icing to run down the sides of the cakes. Steve, the painter, tells me it goes nicely with tea or coffee!! It looks so delicious and it’s easy to make! It’s perfect for spring!